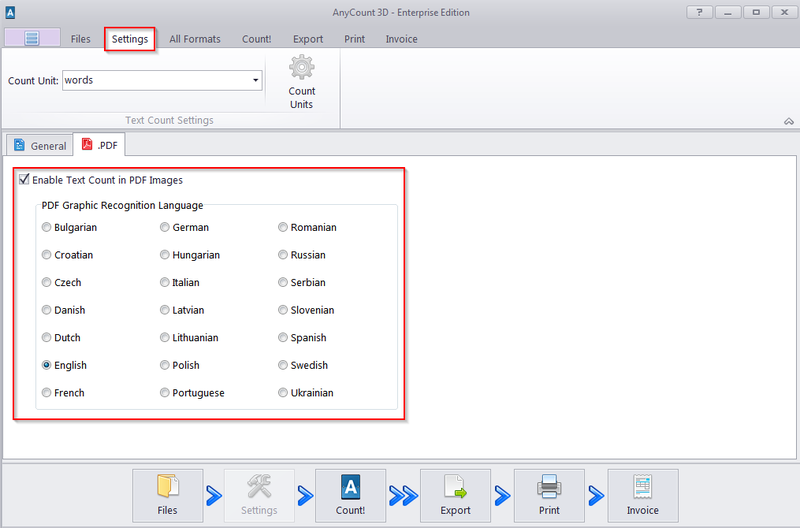 What languages are supported by AnyCount for the PDF file format? If you would like to count recognized PDF files (files that contain selectable digital text), you can use AnyCount for any language. AnyCount Professional and AnyCount Enterprise support this. If you would like to count unrecognized PDF files (files with scanned text or text within images), you need AnyCount Enterprise, which has a built-in OCR engine. Unrecognized PDF and image count is only possible for the following languages: Bulgarian, Croatian, Czech, Danish, Dutch, English, French, German, Hungarian, Italian, Latvian, Lithuanian, Polish, Portuguese, Romanian, Russian, Serbian, Slovenian, Spanish, Swedish, Ukrainian.